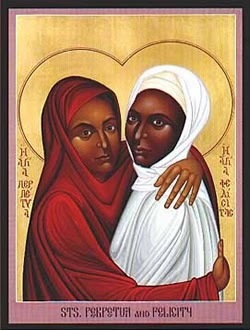 *Saints Perpetua and Felicity were originally buried in Tunisia. A tradition, however, maintains that at some point relics of St Perpetua were transferred to France. By 903 these relics were brought to the French city of Vierzon where they were first placed in L’abbaye Saint-Pierre and then later transferred to this church. *The chapel on the right side of the apse is dedicated to St Perpetua. Her relics, however, are only presented to the public once a year.